Karl Whitney's Hidden City: a brilliant portrait of Dublin. Dublin is a city much visited and deeply mythologized. In Hidden City, Karl Whitney - who has been described by Gorse as 'Dublin's best psychogeographer since James Joyce' - explores the places the city's denizens and tourists easily overlook. Whitney finds hidden places and untold stories in underground rivers of the Liberties, on the derelict sites once earmarked for skyscrapers in Ballsbridge, in the twenty Dublin homes once inhabited by Joyce, and on the beach at Loughshinny, where he watches raw sewage being pumped into the shallows of the Irish Sea. 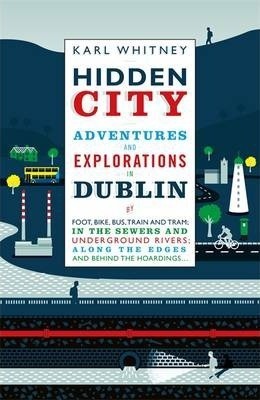 Hidden City shows us a Dublin - or a collection of Dublins - that we've never seen before, a city hiding in plain sight. "Marvellous...The author's eye for observation is second to none...Hidden City is a necessary corrective to a heritage-influenced view of the past and present: for Whitney reminds us that all our environments are human - created for and maintained by us, for good and ill". (Daily Telegraph). "This captivating urban tale has soul, scholarship and insights aplenty". (Sunday Times). "Warm, charming, sharp and informative, this brilliant book is an indispensable guide to contemporary Dublin". (Sunday Business Post). "Oh, how the capital has cried out for a book like this ...a fascinating travelogue that will make you look at Dublin with fresh eyes". (Irish Independent). A native of Dublin, Karl Whitney has published essays in the Dublin Review and the White Review, and journalism in the Guardian, Belfast Telegraph and Irish Times. He is a research associate at the UCD Humanities Institute. Hidden City is his first book.